Not everyone is entitled to Social Security benefits. You may be eligible to receive benefits if you have a physical or mental condition preventing you from pursuing substantial gainful activity. In other words, if you suffer from a condition that does not allow you to pursue a living wage, you may qualify for these benefits. A work requirement can be waived for applicants who can prove they became disabled at or before the age of 22, as you may have been allowed to collected on your parents' work credits without the parent experiencing a loss of benefits. Pain is considered as a qualification but must be reasonably expected to come from a medically determinable impairment diagnosed by an authorized physician. It is imperative you have a medical evaluation of your condition as evidence to proceed. If you are unable to work due to injury or illness, an attorney can help you determine if you are eligible for social security disability benefits. Most SSDI applicants have a legal representative help them apply or qualify for these essential benefits. Having a representative earlier in the application process typically improves your chances of qualifying for these benefits. The average wait time for these benefits to take effect is 90 to 120 days. An attorney can assist in ensuring you aren't waiting too long to fulfill these essential financial needs. Slape & Howard has built an understanding of how the process works and what is needed to promote an quick resolution to obtaining the funds that are guaranteed to qualified applicants in your position. If you are not receiving benefits you deserve, an attorney can help you figure out what is required to meet these standards and if you qualify for compensation. Federal guidelines set a standard rate for representatives assisting with your acquiring social security disability. If you're being denied social security benefits, the legal team at Slape & Howard wants to restore to you what federal law guarantees. You do have a chance of collecting social security benefits following an injury or illness, even if you have been denied. It is imperative that you immediately retain one of our lawyers who is skilled in the area of social security law. Our fees are based on time expended by your attorney and deducted only from past due benefits — never future. You will only owe if your claim is successful. Set up a consultation with a Slape & Howard attorney. We can help you learn if you qualify for benefits or if you are owed past due benefits. Your benefits should be there when you need them most. 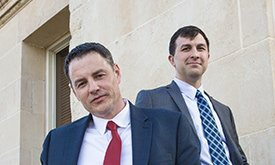 If you've been denied your Social Security benefits, you need an experienced Wichita attorney to stand up for your right to benefits under federal law. Set up a consultation with one of the knowledgeable attorneys at Slape & Howard to see what they can do for you.